The Hartland Covered Bridge in Hartland, along the Saint John river, New Brunswick is a historic landmark that opened in 1901 to make travel easier across the river. 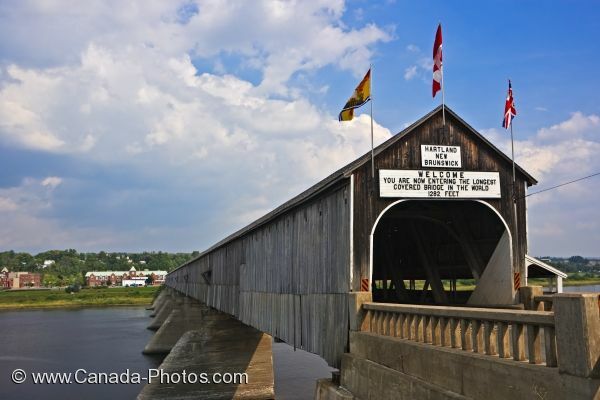 Residents on either side of the Saint John River joined forces back in 1901 and had the Hartland Covered Bridge in Hartland, New Brunswick officially opened. This wooden bridge is the longest covered bridge in the world and has made transportation back and forth across the river much simpler. Hartland Covered Bridge, longest covered bridge in the world and National Historic Site, Saint John River, River Valley Scenic Drive, Highway 2, Hartland, New Brunswick, Canada. Picture of the Hartland Covered Bridge in Saint John, New Brunswick that spans the Saint John River.